Um, the rules *do* apply to you. Although it looks funny, this is gonna cost some $$$. They can’t just add more concrete on top (cold joint) they either have to pull up the entire section of slab, re-lay rebar and pour fresh or cutout a smaller section, drill connecting rebar and pour, but then you have to explain why there’s a patch in brand new roadway. O to the M to the G.
You know, I’ll never say I’m “stuck” on Kirby again. Ever. Sooo this guy just didn’t see the orange barrels or what? I am sure a cell phone was involved. ha ha ha ha ha ha thanks for a great laugh! commonsense, I drove by this morning and it looks like they tore up that whole section. Hope they send the bill to the driver. Hey cool. I’m a Swamplot reader so this was neat to find. 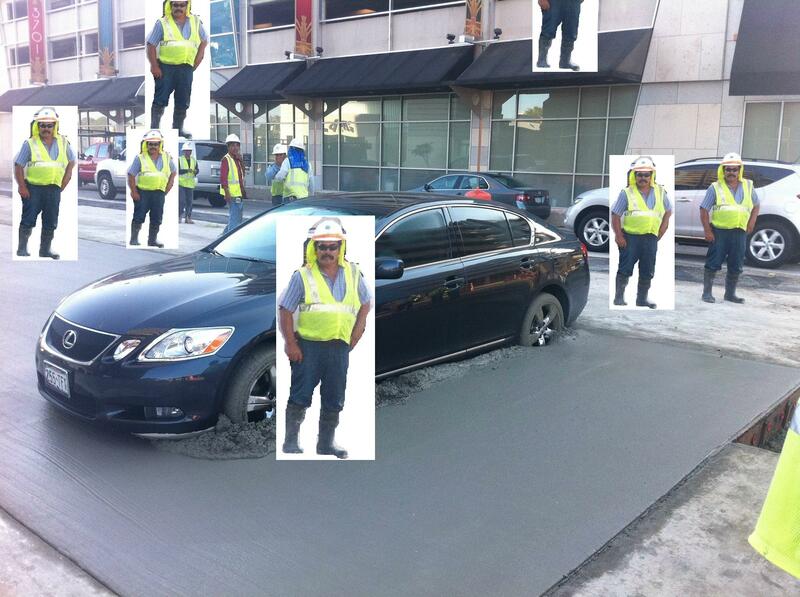 I nominate Lexus stuck in concrete for a new category of Swamplot Award…..
We should thank the driver. Kirby needs to be asphalt, not concrete. Not that I would defend this person, but from the perspective of a seated driver, and the placement of the cones, it might have looked like it was actually a gap in the cones and the entry to a driveway. We have all been in a construction zone before where each day things change and you aren’t ever certain where to go. Not being able to see the bigger picture, it is hard to say for sure. And I’m sure a cell phone was involved as well, further impairing judgement. Has JD not seen what fresh concrete looks like? Evidently, he’s still sitting in the car. No footprints. You know this will result in a lawsuit against the City of Houston. @ JD – I appreciate your optimism about how this could just be one of those things…but pic #2 sure looks like whoever’s car detailer is now in love/hate with him/her got some “DO NOT CROSS” tape wrapped up in the right rear wheel. I’m a day late to this story. Been under a rock. But seeing this made my day! And the Reddit threads are hilarious. Here’s hoping against hope that this is “commonsense’s” car. Ok, I was a week off and picked the wrong newly poured concrete, but I still think I deserve some prognosticatory credit. I’ll just bet she gets crossways with the city too! This guy is a lawyer. That explains everything. The Lexus and the dumbass move into the cement. He was more than likely talking on his cell phone, racking up the billable hours. That said… if she has any of those 1920s doorknobs I could totally use them. Those old knobs and ‘cartridge’ assembly used in old homes are hard to find. I have some in my own house that are worn out and need to be replaced. I hope the driver pays every penny of the damages, minus comedy royalties. commonsense, thank you so much for the laughs needed today. You could understand how the driver might have been confused about where the construction was taking place until you see the construction tape that is wrapped around his back right tire. Look closer, that tape is tied to a thin line strung between the orange barricades. There was no continuous yellow tape, just a fishing line with “caution bows” tied to it. Actually, the do-not-cross tape is NOT on the car, it’s hanging on a wire strung between cones. Just sayin’. Up until yesterday anyways, that is darn close to the break in the cones where cars COULD turn left to get to the 3910 building.